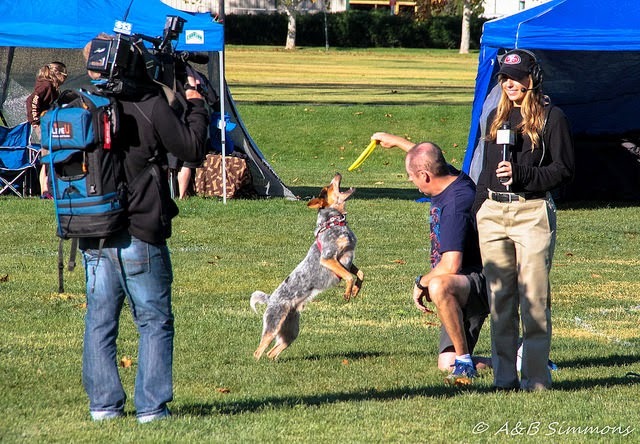 Vader's Disc Dog World: Vader's World Tackles The CA State Championship in Dixon, LOL! 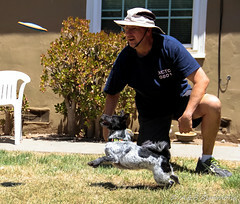 Vader's World Tackles The CA State Championship in Dixon, LOL! 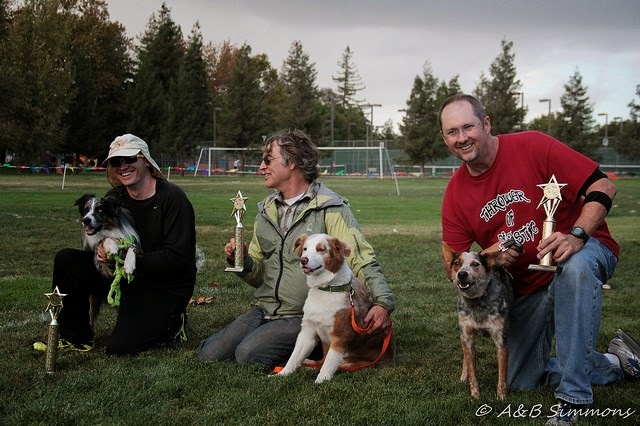 Last weekend, Team Vader hit up Dixon for the two-day Golden State Disc Dog Championship, or The Crusty Classic. We went full of hope, vigor and promises. 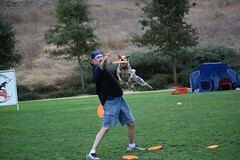 That, and the club I am a part of, Disc Dogs of the Golden Gate, was hosting the event. So the pressures were double the norm, as we were at a two instead of one-day event, and we were hosting it. 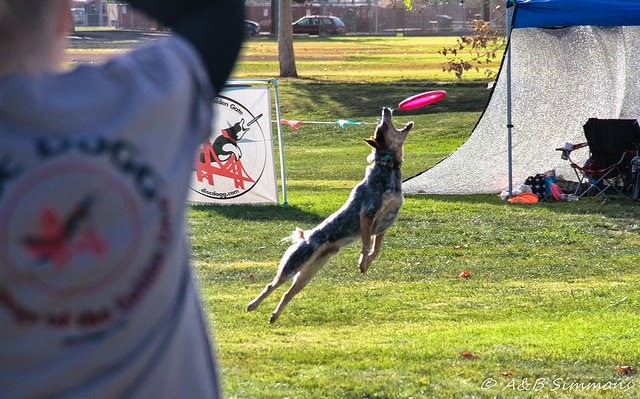 Alas, what would a good disc dog event be without weather, and weather we got. We drove up on Saturday and found ourselves drenched in some pretty decent rain on the drive in the wee early morning hours. We helped set up, set up our own camp (An EZ-Up) and tackled the misty, blustery day as best we could. Sunday was a very different day, indeed. 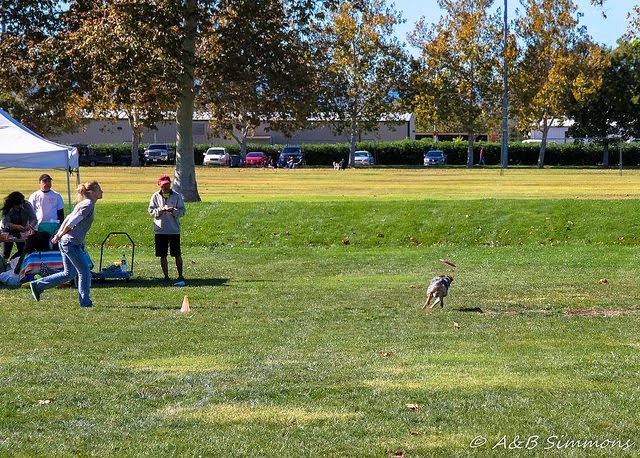 On Sunday the much needed rain took its leave and we were left with moderate winds that either forced us to throw with the wind but into the sun, or into the wind, but with the sun at our backs. 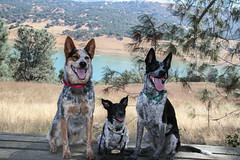 But fates and a flustered or tired dog had a different plan for us. 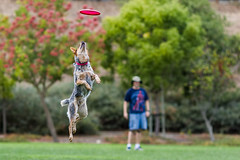 Why Get Dogs a "Dog Disc"
Yes, I was a nervous wreck. I spent about 15 minutes working with Morgan on she could throw the disc and letting her and Vader play a bit so when she was on camera, she would have a practiced throw and Vader would go get it for her. WHEW! On that count. But after that my day went a bit south. Where is it? I just saw it here a second ago!!! Our first round of Toss and Fetch I threw with the wind and watched Vader lose the disc in the sky and blinding sun, resulting in a pretty poor showing. I was fuming when we came back to our tent. Poor Vader knew I was upset and tried his best to talk me down. By barking at me over and over and over with that earthquake-whistle shrill bark of his to calm me down. The migraine did not help. Round two came up and I went with my instincts. I had trained for this, so I tossed into the wind, with the sun at my back. 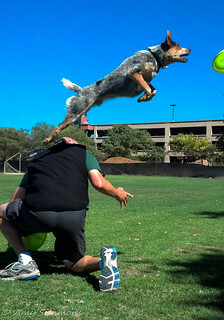 Looking back, I see I needed to throw faster into the moderate winds so Vader could chase the disc, but instead, I did our usual timing, where he goes and then I throw and he chases the shadow of the disc on the ground until it gets bigger or slower and then he gets under it and does that air attack jump he's getting famous for! 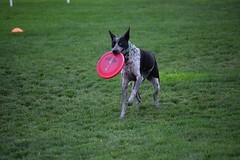 But today the head winds slowed the disc down and he got in front of it and lost it. 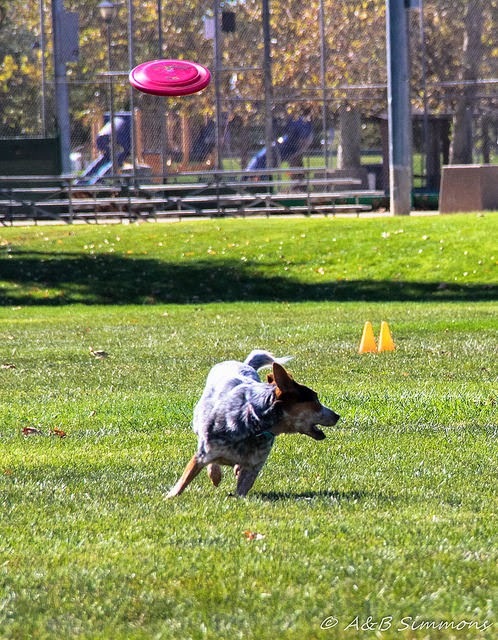 He got to the 90-foot mark but the disc was slightly behind him (and in the sun). He started spinning in a circle looking for the disc while it quietly and gently floated to the ground. The rest of the round was more or less like that and we tanked. Vader will catch most everything, EVEN this shot. Amy had an adequate first day, placing in the middle of the pack, but day two, with our flustered dog and whacky winds, well, if you look at the pic above with the dog running away from the camera, means he had turned hard right to go catch the disc inexplicably turned off course and was floating off the field and into nowhere. Yep, we cratered in a spectacular fashion on Sunday. Go (not) Team Vader! The above pic is exemplary of how Sunday went. Then I went on to personally tank in a few other chores or endeavors that I won't even go into. 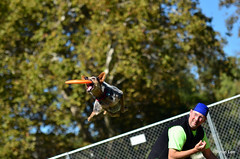 Sunday was the longest day we've ever had at a dog competition! LOL. Well, I laugh now. Maybe not so much then. 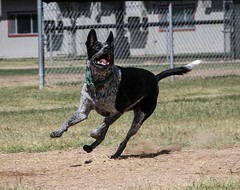 When all was said and done, we had a second place finish with our one happy dog on Saturday and that was cool enough! 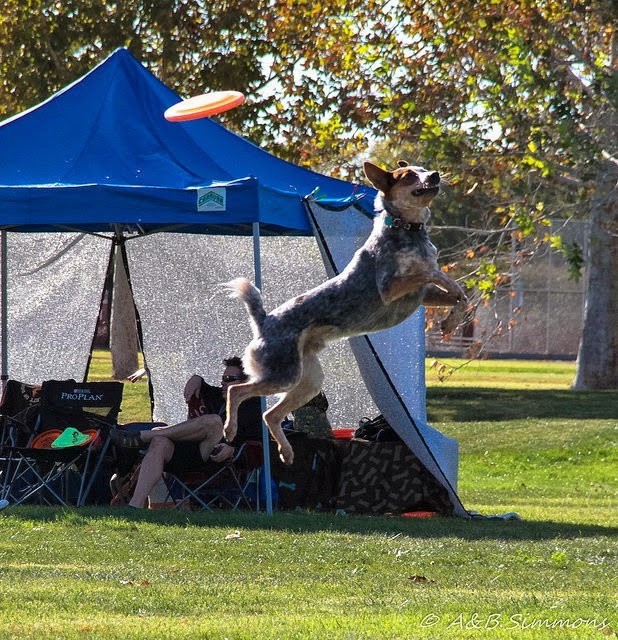 And I enjoyed playing out the season in the intermediate (pro) division, just chasing discs and not worrying about freestyle maneuvers. It's what Vader lives for and loves more than anything else.